Copper is a Tier 1 metal obtained by smelting Native Copper, Tetrahedrite, or Malachite in a Ceramic Vessel or a Crucible. Place an empty or partially filled ceramic tool or weapon mold into the slot to fill it with copper from the vessel. It takes 100 units of copper to completely fill an empty ceramic mold. The text in the vessel's GUI will update to show the amount of copper remaining in the vessel. Place a single empty tool or weapon mold into the first slot on the right to begin the transfer. The arrow will progress, and the filled mold will appear to the right. The empty ceramic mold may appear in the center slot, although it has a chance of breaking and being lost. Liquid copper can be poured into a Ceramic Mold to make unshaped copper. 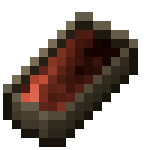 Once the unshaped copper is no longer liquid temperature, it can be placed in the crafting grid to create a copper ingot. The empty mold will be returned to the inventory; although there is a chance of it breaking and being lost. Added Tool casting and tool molds - Ceramic tool molds can be created and filled with metal for Copper or Bronze tier weapons and tools. This page was last modified on 7 June 2015, at 19:22.